-4º this morning with an inch of snow over two days of continues freezing rain. I figured it was a good day to do some reloading. I had purposely neglected reloading after the last few matches knowing I had all winter to catch up. I only loaded 200 rounds of 357 Magnum for Mary's Marlins. I didn't figure I needed to hurry as winter hasn't officially started. My goal is to reload for an entire year. I'm done with .45-70, .38-55, 44 mag, .30-30, 12 and 20 gauge. 5000 more .38s and I think we will be good. I worked on some today, and the tumbler is running now. Bad weather is good for something, it's easier to load when it's nasty out. Slim, you forgot to add that Kaya probably loaded most of it. Hope your family has a happy holiday. Same here. Will finish will 12 ga this week, then start in with rifle, then pistol. Its cold in my garage now but not for long. Ordered myself .38 starline for my present to me. Ya'lll can KEEP that kind of weather! -4 isn't so bad. Got up to give the outside critters some extra grub at 5 a.m. temp was -28. Warmed up to about 4 for the high. 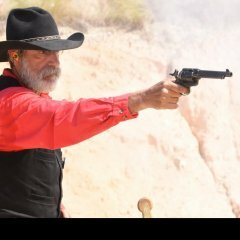 Interests:Hunting, fishing,guns (black powder & modern), ammo reloading, Cowboy Action shooting, metal detecting, Civil War relic hunting & collecting, HO model trains, dogs, genealogy, history, gun club and Masonic activities. The weather around here usually turns to crap right after Christmas, and that's when I catch up on my reloading. Got 3 matches' worth of .45 Colt to do, plus 12 ga. shotgun, then some .38, .357, 9MM, a few stray .45 ACP's and .45 auto rims, then the 500 rounds of Starline .32 auto that my brother-in-law gave me last Christmas. Well, it's 16 deg and I need to change the 650 from .45acp to .38sp. Since the garage isn't heated I think I will wait a few days. We don't heat the recroom that's turned into my reloading, gunsmithing, ammo storage, gun cart, etc room. It'll get down to the 50s without heat. But the light above my reloading bench puts out enough warmth to make it tolerable. My hands get cold handling bullets and brass and my feet get cold on the concrete floor. I need to adjust the dies from 357 Magnum to 38 Short Colt in the Dillon 450. 33 at my house in S Texas this morning. I guess I cant complain! I too have some loading to catch up on, loaded 44-40 & 45 Schoefield with 777 yesterday, will lad 12g 777 maybe tonite. then some 45-70, then work on 38sp. I load all throughout the year. We shoot year-round, although in the summertime it does get HOT. It's been chilly enough here that when I'm not shoveling that white crud I've been reloading. When I get this last 300 loaded, it'll be 3100 in the last couple of weeks. Gives me about 4800 38's done and 1500 44-40's when I get done loading them. I'm not dedicated. I load a hundred maybe 2 then take a 1/2hr + or - an hour and get back at it. Nope. Kaya doing school work. She did work on one of her ammo orders though. I'm killing time in the den. -11 when I went to work this morning. Glad I dressed for it. I was outside almost all day. Ice fishing is started but I just can't when it's this cold. Looks like another reloading day. A front of freezing rain followed by sleet came through just before sunup and now it's drizzling. Mary's working in the kitchen making stuff for our family Christmas party tomorrow. I also worked on loading yesterday, but in my heated shop. Didn't take much heat, but it was shirt sleeve temp in there. Very comfortable. Was working on some Pistol loads for Bowling Pin matches. Heavy bullets at 850 FPS plus velocity. Rather slow process as is the nature of loading very heavy for caliber bullets. However, ammo consumption is low, so it doesn't require large volumes of ammo to keep ahead of requirements. I'm good on CAS ammo for several months, (except Shot Shells), but that won't take long to remedy. Seldom takes more than a box per match, and I can load a flat in less than 2 hours. At my age, I worry more about decent weather in which to do the shooting. Keeping up with ammo requirements is no problem, but cold weather will keep me in the house. Can't chance getting sick because of being out in cold weather. Just the way it is. my comfort zone is narrowing each year. Was going to try to ride the bike (MC) today but slick roads and old bones don't match. Visiting my youngest son, Dirty Dog Dave 55551 in the Twin Cities. Plan to do a little iceboat racing. Home, I'd load some .50-140 3-1/4 and 10 gauge 3-1/2" for inventory. I usually snowshoe to the Forest Service and back to my loading shed. Octogenarians need to keep in shape. I already loaded 500 .38-55 Winchester, 3,000 .45 Colt and 400 .41 Long Colt. I am excited about doing a lot of shooting in 2017. You all know how to shame a guy. Here I am sitting with 23 rounds of 44-40 and 20 12 ga bp rounds after a pretty full year of shooting and I am watching you guys knocking out shells at a pace faster than our increasing national debt. With Fire & Ice and Winter Range just down the road I figured I better get going. I hate to load by the way. Primers, powder, wads, shotgun hulls and brass coming out my ears. So I load up 500 12 ga BP for starters and then prepare for some 44-40 and damn, only about 125 bullets left. Oh well, that's the best excuse to put off more reloading until the postman arrives aggravated with a heavy load of lead. Have a Merry Christmas, a Happy New Year and enjoy whatever holiday you celebrate.